Photo: E. H. Lewis House, ca. 1870, 321 West 2nd Street, Chaska, MN. Listed on the National Register of Historic Places in 1980. Photographed by User:Elkman (own work), 2007, [cc-by-3.0 (creativecommons.org/licenses/by/3.0)], via Wikimedia Commons, accessed June, 2014. Carver County administrative offices are located at 600 East 4th Street, Chaska, MN 55318; phone: 952-361-1500. Historic and Prehistoric Resources of Carver County, Minnesota, Multiple Resource Area, was listed on the National Register of Historic Places in 1980. Portions of the text below were adapted from a copy of the original nomination document. [†] Adaptation copyright © 2014, The Gombach Group. Carver County was considered Sioux Indian territory 1851 when the treaties of Traverse des Sioux and Mendota were signed. These treaties, for the first time, legally opened for settlement land west of the Mississippi River. As was frequently the order of events in Minnesota's development, Carver County grew up first along navigable rivers and streams and then along railroads, progressing generally from southeast to northwest. From 1851 to 1890 approximately twenty-five settlements emerged in Carver County, including river towns, railroad towns, flag stations, ethnic and religious settlements, post offices, retail centers, and resort towns. (Only twelve of this total exist today as incorporated towns.) Indeed, the settlement of town centers preceded farms. During the 1850s, business and trades people marked the frontier's edge; it was only in their wake that farmers followed. Carver County's first settlements — Chaska, Carver, and San Francisco (due to frequent flooding, the history of San Francisco spanned less than a decade) — were all located on the Minnesota River. They were established before the Pre-Emption Law of 1854 opened most of the county's land to settlement. This law also ushered in a period of land speculation that carved out many townsites, lots, and farm lands before ending in the financial panic of 1857. Eight townsites were platted and almost 40% of the county was taken up by farms during this period. Waterways and croplands figure prominently in the early founding and growth of towns in Carver County. The broad Minnesota River was a major transportation route, the Crow River, a power source of then untapped potential. By 1860 several towns were emerging as sites of significant transportation, retail, or trade activity: Chaska and Carver on the Minnesota River, Helvetia and Watertown on the south fork of the Crow River, Waconia on the south shore of the county's largest lake, and Young America, between two large lakes in the southwestern section of the county. All three activities, and industrial enterprises as well, were carried out in Carver and Chaska. Their surrounding agricultural lands attracted Scandinavian and German farmers who formed several small religious settlements, usually composed of a church and a school, at Scandia, Gotaholm, Gotha, East Union, West Union, Ruediger's Settlement, and Holtmeier's Settlement. During the 1860s and 1870s river transportation spurred rapid commercial and industrial growth that propelled Carver and Chaska ahead of Waconia, Helvetia, Watertown, and Young America. The river could not match the railroads as an impetus to growth, however. The construction of railroads in Carver County, beginning in 1872, influenced the county's development to a greater degree than any other single force or event. In that year, a 6-mile stretch of the Minneapolis and St. Louis Railroad was constructed through southeastern Carver County, thus connecting by rail, for the first time, Carver and Chaska with Minneapolis and St. Paul. In 1874 the Hastings and Dakota Railroad became the second railway company to pass through Chaska and Carver and across the southern part of the county. Its construction created a second wave of land speculation, with flag stations and soon-to-be- bustling railroad towns appearing as Dahlgren Station, Benton Station, Bongard Station, and Young America Station. Towns that were established as a result of railroad construction became retail, storage, distribution, and processing centers for the county's rural population and rapidly increasing agricultural production. Towns, intersected by two railroads, including Chaska, Cologne, Norwood, and Waconia, grew at the expense of those without rail transportation or with only one line. Although railroad construction changed the urban hierarchy of Carver County, Chaska retained its original prominent position, becoming an important railroad town as well as a river town. By contrast, Carver's once advantageous location on the Minnesota River was rendered obsolete after construction of the railroads. For various reasons, the county's other railroad towns never established the number and diversity of businesses and industries located earlier at Chaska and Carver. Industries common to many of these railroad towns included sawmills, grist and feed mills, and creameries. In varying numbers, general stores, hardware stores, hotels, saloons, post offices, banks, and an occasional blacksmith, milliner, and jeweler completed the commercial interests located in these towns. Growth in the majority of these railroad towns was characterized by an initial period of commercial and residential construction (1880 to the turn of the century) followed by a period of stagnation (which was most acute in the 1930s). This phenomenon was common to the towns of Mayer, Maple, New Germany, and, to a lesser degree, Hamburg. From 1854 to 1860, agricultural activity lagged behind the settlement of town centers in Carver County with 80% of the county's population centered in towns. During the 1860s, however, the growth of agricultural production and rural population began to outpace the growth of towns. Over one-half of the county's population in 1860 was located in the eastern quarter of the county — where the towns of Carver and Chaska are located. But by 1870 a westward shift in population had occurred. By that year, over three-quarters of the population, or 8,502, was located in townships in the eastern two-thirds of the county and over 70% of the entire county was being farmed. By 1880 the county's population was evenly distributed with the majority of the population farming over 80% of the land. In 1890, after the major period of railroad construction was completed, a significant shift in population density occurred. For the first time the western half of Carver County, which is predominantly rural, contained over one-half of the county's total population. From the turn of the century to the Great Depression Carver County was characterized by increased agricultural activity in its rural areas and by sustained growth — with notable exceptions — in its small and widely distributed urban centers. The county became one of the state's leading agricultural producers as the result of the introduction, beginning in the 1890s, of diversified farming and the subsequent growth of dairy and livestock production. During this period Carver County became known as "The Golden Buckle on the State's Dairy Belt," a label which the citizens of the county proudly wear, figuratively speaking, to this day. The urban areas of Carver County were marked during these decades by a period of consolidation. No new towns were begun after 1890. Thirteen of the twenty-five towns which had been settled in the nineteenth century were either abandoned or consolidated with another community. The balance of the towns Chaska, Carver, Watertown, Chanhassen, Waconia, Cologne, Hamburg, Mayer, New Germany, Norwood, Young America and Victoria — grew in population during these decades but at less than their rapid nineteenth century rate. These towns were supported largely by agriculturally related businesses and industries. Feed mills, the majority of which were owned and operated by farmers' cooperatives, appeared in all of these towns between 1890 and 1920. During this same period, small creameries, many of which were also run by cooperatives, began operating in Chaska (2), Carver (1), Watertown (1), Waconia (2), Cologne (1), Hamburg (2), and Mayer (2). The state's largest creamery (located midway between Cologne and Norwood), which continues to produce the nationally famous Bongard's Cheese, experienced substantial growth during this period. The towns of Norwood and Young America became two of the state's major livestock shipping centers. Continuing this same trend toward industrialization, food processing became, after the turn of the century, the county's leading industry with factories located in Chaska (the Crystal Sugar Beet Processing Plant), Carver (the Cream of Barley Plant), Watertown (the Green Giant Canning Factory), and Waconia (the Waconia Sorghum Factory). Another common phenomenon after the turn of the century was the disappearance or incorporation by larger towns of small railroad settlements (known as flag stations), such as Augusta, Dahlgren, Benton, Bongards, and Coney Island (on the north shore of Lake Waconia). The functions once served by the general stores, post offices, and depots in these towns were usurped by the county's larger towns. The county's religious settlements — Scandia, Gotha, East Union, West Union, Ruediger's Settlement, and Holtmeier's Settlement — were exceptions to this trend. These settlements continued, despite rapid changes throughout this period to the contrary, to be a mainstay in twentieth century rural Carver County. Although the day to day reliance on the church which had characterized each settlement's "pioneer period" had ceased, the churches, schools, and parish halls in each of these settlements continued to serve their respective congregation's religious, social and educational needs. The social and economic impact of the Great Depression dealt a negative blow to the county's post-settlement prosperity. The events surrounding the depression — which were followed in the 1940s by rapid technological changes in agriculture and industry by the abandonment of railroad transportation in favor of improved county and state highways, and by the out-migration of the county's third and fourth generations in search of employment and of the amenities offered by larger cities resulted in the decline of Carver County's smaller towns. Beginning in the 1940s Carver County joined a nationwide trend in which trucks replaced railroads as the principal carriers of farm products. Since creameries and cheese factories had to provide pickup service or a competitor would, the truck became important most rapidly in the dairy industry. The farmer ceased bringing the milk to the railroad station to be hauled to the city on the "milk train." By 1948, 97% of the nation's milk moved by truck and 3% by a combination of truck and rail. In that same year national figures reveal that 91% of farmers' grain and 88% of their livestock were transported to market by trucks. The effects of this phenomenon on the county's towns and rural areas were many. For the first time farmers (who were then farming over 90% of the county) could produce, harvest, and transport their farm products to markets without outside interference. For a number of years prior to the 1940s, the farmer had been compelled to rely on the railroad shipping agent — who dictated when farm products could be shipped and the quantity that could be shipped. In addition, the farmer had been required at various times in the county's history to pay exorbitant shipping rates. Towns which had been founded and which had prospered as a result of the railroads were most seriously affected. The railroad towns of Mayer and New Germany, for example, because of decreasing railroad transportation, experienced dramatic reductions in population growth and in commercial and industrial activity. The depots, hardware stores, general stores, barbershops, and banks in both towns were abandoned in the 1950s and are now deteriorating. Both towns have become by 1978 "bedroom communities" with a majority of their populations commuting to jobs in nearby towns or the Twin Cities. A small percentage of Mayer's population of 325 is supported by a feed mill and creamery. Many of New Germany's 303 citizens rely on a feed mill, a gasoline distributorship, and a liquid fertilizer plant for local employment. Towns such as Victoria, Waconia, Chaska, Cologne, Norwood, and Young America, which had relied upon railroads to a lesser extent and which were by the 1950s located on one or both of the county's two state highways, experienced renewed commercial and industrial activity and population growth. This activity, as well as new residential construction, occurred along the highways which intersect these towns. The result was a shift of commercial activity away from the historic urban center towards the highways. The "commercial strips" that resulted contain automobile-oriented businesses, such as motels, fast food restaurants, and gas stations. Despite this shift, the buildings in the small downtowns and the historic residential neighborhoods have not deteriorated. During the 1960s the suburban growth of the Twin Cities expanded to include a third ring of suburbs. This expansion into the northeastern third of Carver County dramatically affected the development of large portions of Chanhassen, Chaska, and Laketown Townships. These townships, which had been since settlement largely devoted to farming were rezoned from agriculture to multi-family housing, commerce, and industry. Following closely upon the heels of rezoning was a development — known as the "New Town of Jonathan" which was designed "to provide an alternative to living in the contiguously built-up areas of the Twin Cities Region." In 1966 2,200 acres of land located within a triangle formed by the towns of Chanhassen, Victoria, and Chaska, were bought by the Jonathan Development Corporation. Today almost 8,000 acres are incorporated into the "New Town of Jonathan." Although the recession of 1975 and the threat of foreclosure by the New Community Development Corporation (HUD) on a $21 million commitment seriously affected the future of this development, it currently provides residential units and commercial enterprises for a community of 7,000. Ten acres are devoted to office activities; 121 acres of land devoted to industry provide 1,500 jobs. 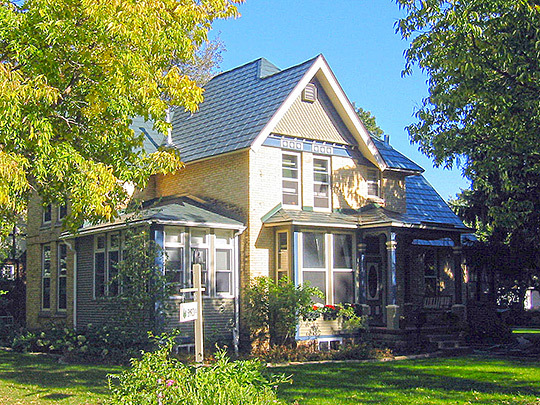 Like Mayer and New Germany, the towns of Victoria, Chanhassen, and Carver have become "bedroom communities," but have retained their small downtowns and well-preserved residential neighborhoods. Other towns, including Chaska, Watertown, Waconia, Cologne, Norwood, and Young America, have retained traditional small-scale businesses and industries, and their small town rural character. Demographic studies reveal that Carver County will not experience a high percentage of growth by 1990 and except for Chanhassen and Victoria will maintain its rural character. † Lynne Spaeth and Ted Lofstrom, Minnesota Historical Society, Historic and Prehistoric Resources of Carver County, Minnesota, nomination document, 1977, National Park Service, National Register of Historic Places, Washington, D.C.